The mechanical efficiency of the leg extensor musculature of men and women was examined with a special “sledge ergometer”. The subjects (ten males and ten females) performed (a) pure positive work, (b) pure negative work and (c) a combination of negative and positive work (strech-shortening cycle). The mechanical efficiency of pure positive work was on average 19.8±1.2% for female subjects and 17.4±1.2% for male subjects (t=4.12, P<0.001), although the work intensity was equal in both groups. The mechanical efficiency of pure negative work was slightly lower in women than in men (59.3±14.4% vs 75.6±29.3%). The mechanical efficiency of positive work (η+) in a stretch-shortening cycle exercise was 38.1±6.8% in men and 35.5±6.9% in women. The utilization of prestretch was better for female subjects at low prestretch levels, whereas males showed greater potentiation of elastic energy at higher prestretch levels. Regarding absolute Wel (work due to elasticity) values, male subjects showed greater (P<0.001) values than females (189±44 J vs 115±36 J, respectively). 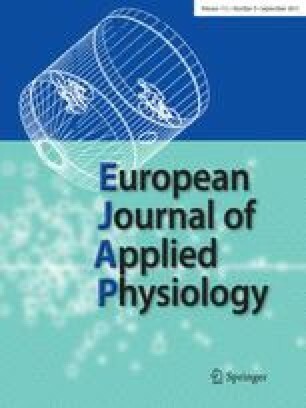 Fundamental differences in neuromuscular functions in men and women might cause the differences in the results obtained.